Quinoa is one of the most nutritions foods in the world. It can help you slim down, regulate your metabolism and fight diseases. 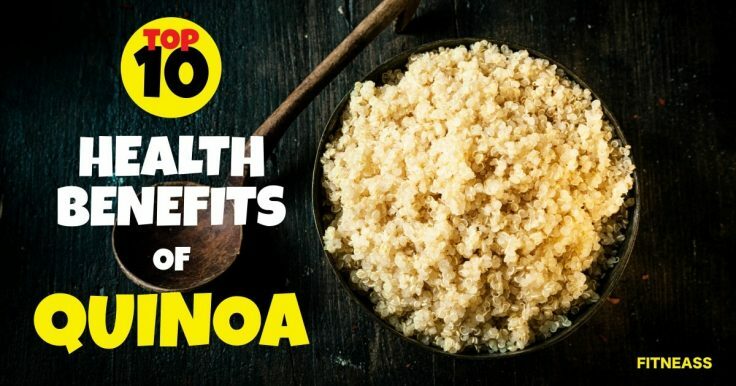 So let’s find out more about the amazing health benefits of quinoa! Quinoa is an edible seed which is taken as a dietary staple in South America. It is quite similar to brown rice, regular white rice, and barley. It’s a food which has got it all, rich in fiber, magnesium, potassium, calcium, phosphorus, Vitamin B, and E plus various other beneficial antioxidants. Also, it’s rich in protein, gluten-free and contains all nine essential amino acids. Having a lot of nutritional content, quinoa was considered as “mother of all grains” back in the days of Inca Empire in the 16th century. Quinoa has been popular in health-conscious people nowadays but has been consumed for thousands of years in South America. This seed is a perfect escape from regular white rice and is a great substitute for oatmeal. Its one cup provides 5 grams of fiber and 8 grams of protein, having just 222 calories. Quinoa serves as an alternative to meet the increased demands of food quality for the countries having food insecurity with relevance to climate change. It is an easy pick for a diet rich in protein, swapping regular oatmeal with quinoa flakes could be the first step towards a healthy diet. Quinoa is a seed consumed as grain by health-conscious people. It comes with a total of 222 calories having 39 grams of carbohydrates, 4 grams of fat with a small amount of omega-3 fatty acids. It’s grown organically and is considered as a whole grain food being gluten free. Quinoa is rich in flavonoids, which are best known for their anti-inflammatory and anti-oxidants health benefits. Quinoa contains fiber than most of the grains. A cup of quinoa contains 17 – 27 grams of fiber, which is twice the amount in most of the grains. Fiber helps in reducing the development of Type II diabetes (7), blood pressure (8), inflammation and helps in maintaining a healthy weight. It also normalizes your energy (9), helps maintain bowel health and lowers cholesterol level in the body. It can increase the anti-oxidant (11) and gluten-free value in a diet. A gluten-free diet is beneficial for the ones with the chronic gastrointestinal disorder called irritable bowel syndrome. Quinoa is rich in protein and has all essential amino acids required for a complete diet. A lot of other plant foods lack a certain amino acid called lysine which helps in protein synthesis, which quinoa has. Since quinoa has a good amount of protein so it can repair and build tissues fast. Foods having higher glycemic index increase hunger and cause obesity. High blood sugar level can cause hyperglycemia, diabetes, dehydration, and other serious complications. Quinoa is quite rich in minerals; it contains magnesium, potassium, iron, and zinc. A cup of quinoa has 30% of RDA which is good for heart health, prevents migraine headaches, and relieves muscle aches and spasms. Since quinoa has a good content of iron, it helps to maintain the adequate iron level in the body. This is essential because it forms an important component in hemoglobin which in turn adds oxygen to our blood. Quinoa is rich in anti-oxidants which help neutralize free radicals that can cause several diseases like cancer. Foods rich in anti-oxidants help to fight against aging, and quinoa is one of them. Researchers at Columbia University’s Celiac Disease Centre found that gluten-free diet’s nutritional content was increased by adding quinoa to it. One cup of cooked quinoa contains 58 % of the RDA of manganese, which acts as a catalyzing agent in the functioning of enzymes. Quinoa helps to lose weight by keeping a check on it. Losing body weight can be done either by intaking fewer or burning more calories. Since quinoa is rich in protein, it increases your metabolic rate and helps increase your muscle mass. As an effect, you’ll lose weight faster, easier, and safer. Quinoa could become your favorite option as a food because it takes just 5-10 minutes to cook and tastes great, better than rice and millets, plus it has got all essential amino acids. Ferment to make it as beer or chichi, a traditional drink prepared by the Andes. Hopefully these 10 health benefits of quinoa made you give this amazing seed another chance. And who knows, maybe it’ll be your favourite dish.